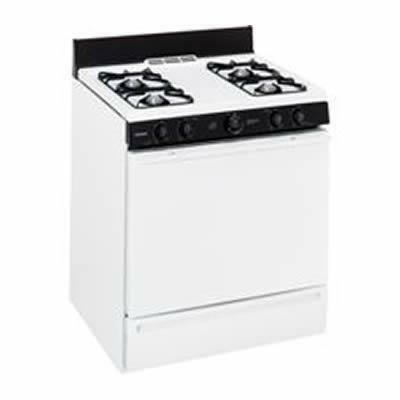 Hotpoint® 30" free-standing gas range features cordless battery ignition, low battery indicator light, Porcelain upswept cooktop and more. Additional Information Extra-large oven capacity; All purpose burners; Cordless battery ignition; Low battery indicator light; Porcelain upswept cooktop; Lift-up cooktop; Easy clean subtop; LP Conversion Kit included. Burners/Elements Output Natural gas rating: 9,1k BTUs; Liquid Propane rating: 8.0k BTUs.